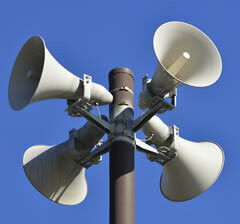 As I write this on June 3 the monthly test of our tornado warning sirens is underway even as we are looking at a significant chance for severe weather during the overnight and early morning hours today and tomorrow. On top of that, the local paper has an article on Habitat for Humanity building three homes in Gifford, Illinois which was heavily damaged by a tornado on November 17 and I spent part of the weekend in Washington, Illinois, my home town, which was devastated by an EF-4 tornado on the same day. With the harsh winter behind us, rebuilding is underway in earnest in both of those towns. 500 of an expected 1,000 or so building permits have been issued in Washington where the biggest current problem is keeping contractor trailers from blocking streets. Both towns await an announcement about state aid since federal public assistance funds were denied under the formula that penalizes small communities in states with large population centers. All of this is prelude to a reflection on the remarkable strides made by the Storm Prediction Center (SPC) over the past decade or two. Back in November, we were alerted by the SPC four days out that there was likely to be an unprecedented, possibly tornadic, event for that late in November. This Spring the SPC has unveiled enhanced four to eight day outlooks. These tools assist local National Weather Service offices, commercial weather services, broadcast meteorologists, emergency managers, weather geeks like myself, and others as they prepare. Vesicular Stomatitis (VS) is a virus that affects horses, cattle, swine, sheep, goats and some wildlife species. 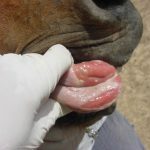 Vesicular Stomatitis is easily recognized by blisters (vesicles) that may occur in the mouth, nose, lips, tongue, coronary bands of the hooves or around the teats and genitalia of animals. This disease tends to spread across the western United States with warm weather and if present is usually seen in the southern states first and may occur along rivers and streams. It is not known exactly how the virus overwinters but that flies appear to be common vector. The majority of animals infected with VS will not die, but its occurrence can be a highly economically devastating disease due to loss in milk production or loss of weight due to pain and discomfort when eating or drinking. Vesicular Stomatitis is a reportable disease to state and federal animal health officials and mimics the clinical signs of Foot and Mouth Disease and Swine Vesicular Disease. A specially trained veterinarian known as a Foreign Animal Disease Diagnostician will be called out to take samples and conduct an epidemiological investigation to complete the diagnosis. 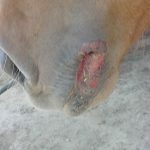 Infected animals should be housed a distance away from non-clinical animals and their movement restricted until signs of disease are gone and the chance of infecting other animals has passed, usually 21 days after the lesions have healed. Although VS is considered endemic in the United States it is an international reportable disease, resulting in movement restrictions of U.S. animals by other states and our international trading partners when a new diagnosis is made. At this writing only two counties in Texas have been diagnosed as having new cases of Vesicular Stomatitis. 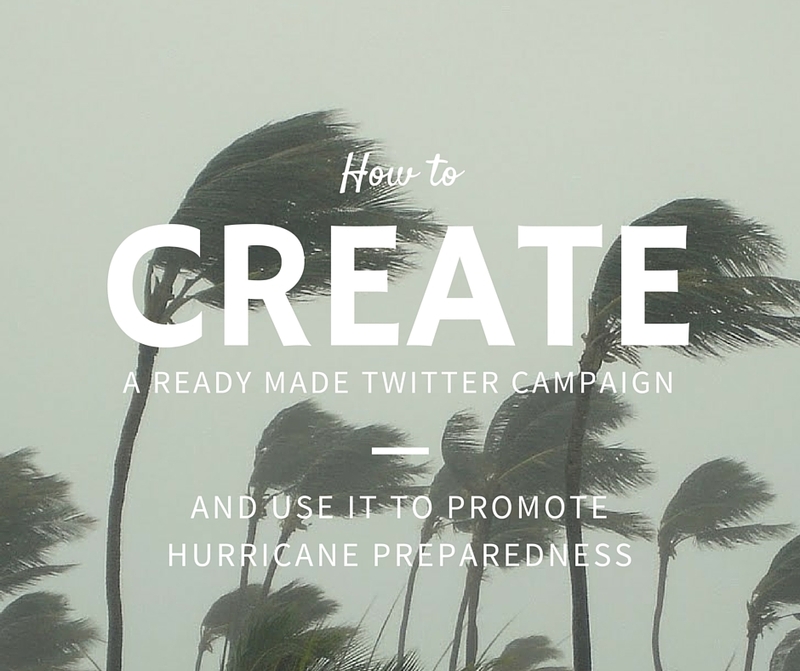 Brought to you by Office of Public Preparedness and Response within the CDC, Ready Wrigley Prepares for Hurricanes is an activity book available in English and Spanish. It tells how Ready Wrigley helps her family get ready for a hurricane and then what they do during and after the storm. FLASH (Federal Alliance for Safe Homes) offers Pick-A_Peril series of videos. This set is about how to prepare your house for hurricanes. Be sure to also check out the other perils found on the site. How can I reduce the risk of a tree falling on my house during a storm? eXtension provides resources such as this to help you learn what you can do to protect your property from storm damage. 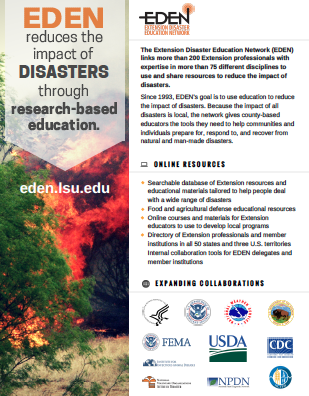 LSU AgCenter has a series of disaster information fact sheets for agriculture producers.